Monique Wales has been drawn to the old world techniques of producing multiple originals, commonly called Printmaking, since her days as an art & architecture student at CCSF. Working primarily as a digital artist in marketing for nearly 20 years, Monique returned to her original love of hands-on art five years ago, founding Red Tail Studios. While Monique also works in copper plate etching and woodblock relief, her main focus is on reductive linocut relief printmaking. She also enjoys forays into encaustic painting as well as large-scale acrylics. She finds the meditative, time-consuming and intricate nature of intaglio and relief enhances the experience of creation in her works. Printmaking involves nearly all the senses, from the tactile carving of the wood in a relief print, to the sound of the needle working a copper etching, the smell of the studio when mixing up the ink, and of course, the visual revelation as the image slowly emerges on the paper, layer by layer, through the work of the press or by her own hand-held baren. 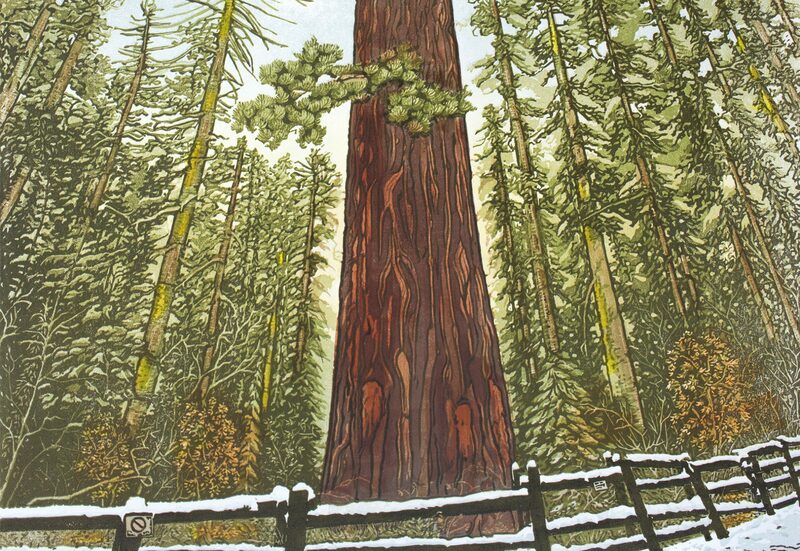 Her artwork is largely nature-inspired, particularly by the magnificent mountain areas in and around Yosemite. Monique hopes to bring awareness of the importance of wild spaces and their increasingly threatened inhabitants to her audience. She strives to bring into her work the feelings of peacefulness, serenity and wonder she experiences when witnessing the world outside our walls, whether it’s found deep in the forests of the Sierras, along the California coast or on her travels to other parts of our beautiful planet. Gallery Inquiries: An artist’s packet is available on request. Monique has works in the permanent collection of the Maryhill Museum of Art in Goldendale, WA, as well as in private collections in Australia, Canada, the United Kingdom, and throughout the United States. Isn’t change wonderful? Best of luck on your new adventures! Thank you for following my blog. Look forward to rerading more of yours. Cheers!